Today is the last day for enrolling in our Power BI Play Date. Don’t miss out on this amazing opportunity to learn, use and benefit from Power BI at your work. Check out my online class and sign up before the doors close at midnight. Click here. Let’s get our Simpsons on then. D’oh, How often Homer says his favorite things? Here is the visualization to explore Homer’s (and other character’s) favorite sayings in 27 years worth of Simpsons episode. Have a play. To answer this question, we need to access Homer’s brain. It is in a high security vault, otherwise known as his skull. 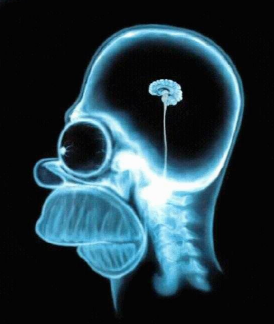 But we can’t connect to Homer’s brain as data source in Power Query. What then? I am kidding. We can simply Google for this. And we quickly land at Kaggle’s Simpsons Script Dataset. This contains 27 years of Simpson’s script, character, location and episode data. Download and load these tables in Power BI as tables. set up episodes[image_url] as Image URL data category thru Modeling ribbon. Why stop with D’oh. Let’s make a list of all phrases you want to investigate. Using “enter data” feature of query editor (Power Query) create a list of phrases you want to explore. Add a few vizzes (tables work great, but try others too) to see how many times each character spoke that phrase. Explore and Enjoy. I made a video tutorial explaining the entire process along with many tips on data clean up thru Power Query, measure writing and visualizations. True to Homer’s style, there is a d’oh moment in the video where I realize a fatal flaw in the analysis and fix it. Check it out below. See this video on our Youtube channel. If you love to play and learn, you are going to love our Power BI online class. In this program, you will learn all about Power BI from basics to #AWESOME level. You will get 9+ hours of video content covering Power Query, Power Pivot, Power BI and elegant dashboard design techniques. Check it out and sign up today. Hmm, I noticed some Dutch in "https://chandoo.org/wp/resources/power-bi-play-date/". Any Kasper involved?